Jet Set Line offers a variety of services for groups of all sizes that include motor coaches, convention shuttle services, corporate, airport transportation, venue transportation, arranged sightseeing tours, out-of-town charters, around the state and nationwide. Luxurious European motor coaches with a capacity of 49, 58 and 61 passengers. Fully equipped with DVD, TVs, AM/FM and CD player, P.A. system, panoramic windows, reclining seats, air conditioning, individual reading lights, spacious lavatories, and huge tinted windows for clean vision. Vehicles monitored and tracked via GPS satellite tracking device (www.atroad.com) which allow us to continuously monitor the location, speed and direction of our fleet. Uniformed, courteous, and professional drivers with clean driving records. Winner of "McRell Safety Award" given by the united bus owners of America. We are school board approved in the State of Florida. 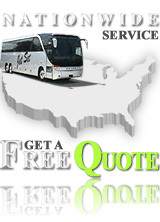 24 hour road service assistance. After exiting your aircraft, follow the signs to baggage claim A. The airline concourses are connected to the main terminal via an elevated tram. Exit the tram, and follow the signs to baggage claim A. Once you arrived at the main terminal, pass the security area, continue to follow signs to the baggage, and then take the escalator or elevator down to baggage claim on level two. After you find your luggage, gather your entire group together, please walk down to the "Ground Transportation" and pick an empty parking space, the sign is going to read A and a number. Call us to our toll free number 1-800-824-1065 or 407-649-6599 our dispatch will answer you right away and will send the bus that will be waiting on the holding area just 5-8 minutes from the parking space. Please only when the whole group or the bags are not downstairs.